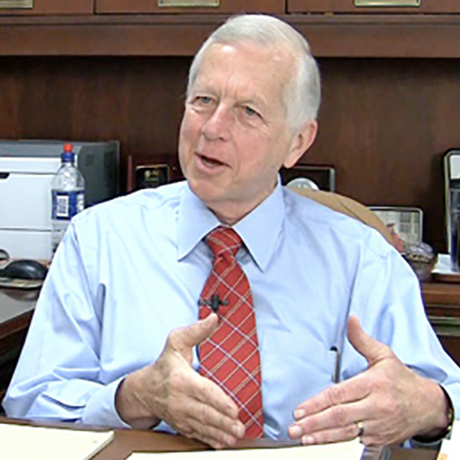 McClelland served as the president and CEO of Goodwill Industries of Central Indiana for 41 years prior to assuming his current role as Indiana’s executive director for drug prevention, treatment, and enforcement. He also has remained involved in the life of his alma mater via volunteer leadership and service through appointments on the ISyE Advisory Board and the Georgia Tech Grand Challenges Advisory Board. McClelland graduated from Georgia Tech during the Vietnam War and served a three-year military tour of duty. His last assignment was in Washington, D.C., and during his free time he volunteered as a tutor for a church-based program that served children in low-income neighborhoods. The church also had a Saturday program for children with disabilities, and McClelland volunteered to transport the kids participating in the program. After going through an executive training program and running a Goodwill organization in Texas, McClelland was recruited to Indianapolis, Indiana, to serve as vice president of operations for Goodwill of Central Indiana. In less than a year, he was promoted to president and CEO, and he spent the next four decades helping to transform lives through the organization. Under McClelland's leadership, Goodwill of Central Indiana grew to over 3,200 employees with an annual revenue of more than $130 million. McClelland and his team began examining the links between poverty, low education levels, crime rates, births to young unwed mothers, and a myriad of health issues. They found “an enormous amount of data showing how these issues are all interrelated; they reinforce and compound each other,” McClelland said. This wealth of information eventually led to the 2010 opening of The Excel Center, a diploma-granting high school Goodwill designed for older youth and adults who had dropped out of high school. There are now 13 Excel Centers operating throughout Indiana, and the model is being licensed to organizations in other states. Goodwill links the young moms (median age 20) with education opportunities in The Excel Centers and employment opportunities at Goodwill or other companies. They also help connect families with other services they might need in a holistic, two-generation approach that has lasting impact. After stepping down as CEO in 2015, McClelland thought he was transitioning into retirement. Then he had a conversation about the impact of the opioid epidemic in Indiana with the chief of staff for Governor-elect Eric Holcomb. That fateful conversation turned into a job offer to become Indiana’s drug czar. He reports directly to the governor. “The opioid epidemic is destroying lives, devastating families, and damaging communities. It cuts across all socioeconomic lines. It’s an incredibly complex problem, and the only way we’re going to substantially reduce it is through a systems approach that includes complementary public health and public safety approaches. My job is to coordinate, align, and focus the relevant resources of nine state agencies and to leverage the state’s resources with those of other sectors — business, higher education, health care, philanthropies, and faith-based organizations for greater impact,” McClelland said. As he forges ahead in this second inspiring career, McClelland continues on his path of helping others while embracing lifelong learning. “I have a very low need to be entertained but a strong need to learn. You just have to keep learning,” he said. 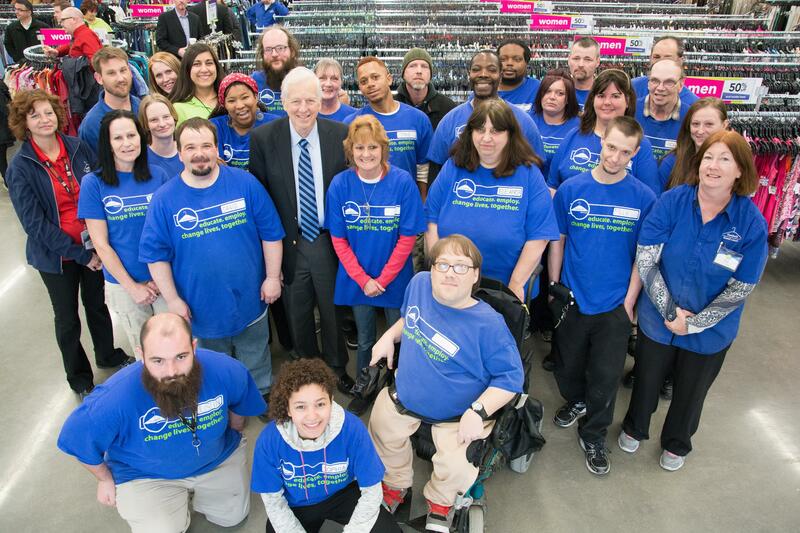 Jim McClelland with a group of Goodwill employees at the Noblesville, Indiana store. In preparation for stepping down as CEO of the central Indiana Goodwill organization, McClelland went on a “farewell tour” of all the region’s facilities in spring 2015. 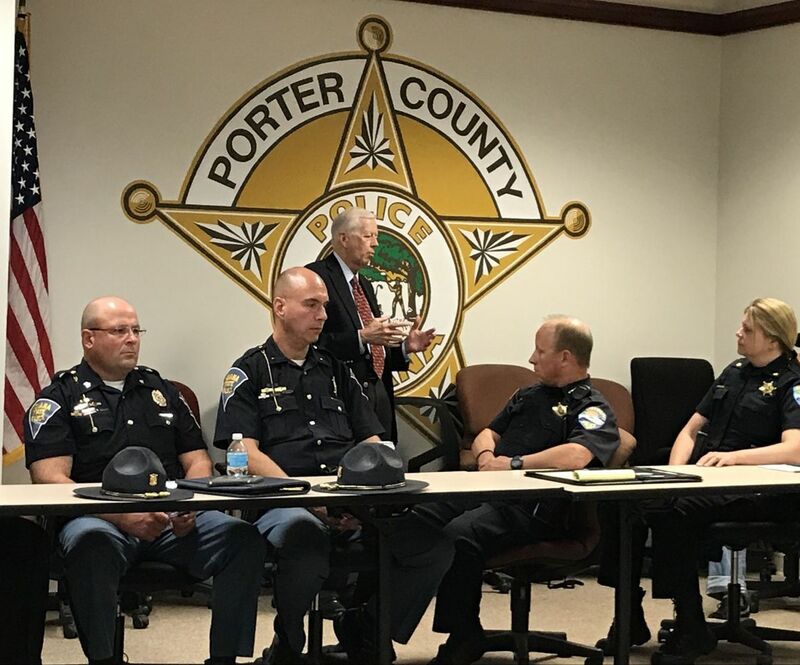 Jim McClelland, in his role as Indiana’s drug czar, makes a presentation to a group of law enforcement officers and community leaders from across several northwestern Indiana counties.